st gives a lecture, titled "Material odyssey" in invited lecture series of Korea University 2018 academic year at 5pm, oct. 01. 이승택 소장이 고려대학교 (건축학부 초청강연 시리즈) 에서 "material odyssey"라는 주제로 강연합니다. 10월 1일 오후 5시부터 2시간 동안 진행됩니다. stpmj participated as an interviewee for Damdi’s new publication, “Architectural Material Series” just released. 에스티피엠제이가 담디출판사의 새로운 책, “Architectural Material Series” 에 참여하였습니다. st gives open critique and lecture in the final review of Kyunghee University at 2pm (sep. 07) in Korean Artist & Artisan Gallery. 이승택 소장이 경희대학교 졸업 전시 공개 크리틱 및 특강을 9월 7일 오후 2시부터 한국정품문화관 갤러리에서 진행합니다. 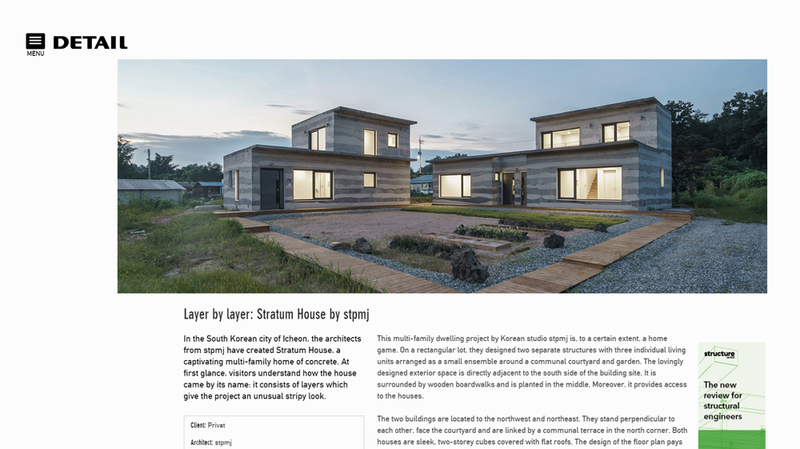 The masonry & beetle are featured in AW(archiworld), vol 280. 조적집과 물방개가 건축세계 280에 소개되었습니다. mj gives a talk in a series of "Women in Architecture / Building Role Models" at 12-2pm on Sunday, Jul. 17th in Seoul Center for Architecture & Urbanism. It is organized by BRM & Korea Architects Institute, and sponsored by Green Lamp Library. 임미정 소장이 "빌딩모델즈-여성이 말하는 건축"에 참여하여 6월 17일 오후 12-2시에 돈의문박물관마을 서울도시건축센터에서 대담을 진행합니다. 여집합과 새건축사협의회가 주최하고 그린램프라이브러리가 후원합니다. Nara Cellar Office is featured in a book, INTERIOR WORLD 162 (ISSN 1599-2896). 나라셀라 오피스가 인테리어 월드 오피스 편에 게재되었습니다.